Cloning is a very common technique used by a large variety of plant growers. When growing plants from seeds there is an important unpredictability factor in what you might get so cloning ensures that you get a clear genetic copy of the parent and therefore removes a lot of the variability inherent to the growing process when starting from seed. To perform the cloning process most growers use the aid of rooting hormones which are usually sold in the form of a gel at high prices. Today we are going to learn how to make our own DIY plant rooting gel using ingredients that can be easily bought online for a fraction of the cost. A scale that can weight with enough precision according to the amount you want to prepare (for 1L you will need a +/- 0.1g scale). Warning: Potassium hydroxide is a very strong base. Handle with a lot of care wearing protective eye wear and nitrile or PVC gloves. Do not agitate it before opening it since KOH powder is very caustic. Once you get these ingredients the process is quite simple. For a one liter preparation add 500 mL of water to one container (we will call this one A) and 500mL to another container (which we will call B). Add 3.0g of the Indole-3-butyric acid to the A container along with 0.6g of potassium hydroxide and mix until both are dissolved. Heat the water in container B to 120-140F (48-60°C), stop heating and add 9.0g of Carbopol 940. Mix the water in container B thoroughly, the Carbopol 940 might take a long time to get hydrated and get into solution, stir it until there are no visible clumps (this can take around 15-60 minutes). Once this process is done wait for B to cool to ambient temperature, then mix A and B slowly (in whichever has the largest container). When you do this the viscosity of the mixture will start to increase exponentially and you will have your rooting gel preparation. The amount of money it takes to prepare 1L is around 3 USD while the most popular rooting gel products online are charging you around 16 USD for 100mL of basically the same thing. 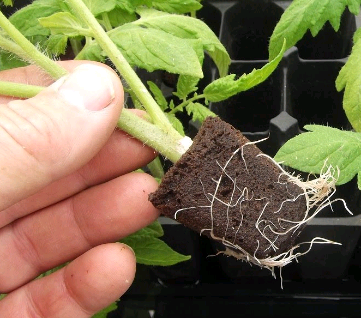 This means that you will be saving 98% of your rooting gel costs if you make your own. There are some other additives - including preservatives and biostimulants - that we could add to make a better product, but that's a topic for another blog post. Wow, many thanks again Dr. Fernandez for this wonderful topic. Hello. Nice to see, another DIY post. Can I use another geling agent, or carbopol only. Thanks. I have only tried poly-acrylic acids like carbopol. Other gelling agents might cause problems with the plant - they might be pythotoxic or might attract fungi - or interact with the rooting hormone in unwanted ways. I therefore recommend only using carbopol for this. If you want to learn more about making a rooting gel with adequate preservatives please book an hour of consulting time. Thanks for posting! Hi, great article! Can coloring be added to this mixture? What percentage is the iba at? also how can I add NAA to it and how? Thank you.